The kick-off time has changed for Brighton & Hove Albion's last home match of the season, against Bristol City on Saturday, April 29. The match has been selected to be shown on Sky Sports and will now kick-off at the later time of 5.30pm. 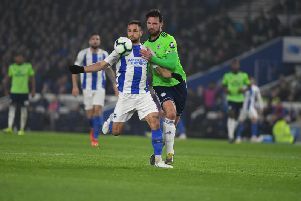 It will be Albion’s fourth live televised match in April, after the matches away to Queens Park Rangers, Wolverhampton Wanderers and Norwich City. This season’s reverse fixture between the two sides at Ashton Gate was also shown live, as Steve Sidwell’s stunning strike from the halfway line helped to secure a 2-0 win for the Seagulls back in November. Brighton's season finishes the following week, away to Aston Villa on Sunday, May 7.